Get Vendio Gallery - Now FREE! Hours 7:30 to 5:00 EST M-F till noon on Saturday. This sale is for (3) or a complete set of MULCHING blades for a 5' Howse finishing mower to fit the model C360. These blades are not offered by Howse but by popular demand for a mulching blade we have found them. We also sell the belts and spindles and the regular blades. Here are the specifications on the blades. 20-1/2 (520.7mm) from tip to tip. 5/8 (15.8mm) center hole. Thanks and let Jesus have a turn with your problems! Sellers: Add a FREE map to your listings. 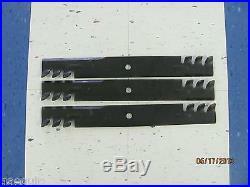 The item "3 REPLACEMENT MULCHING BLADES FOR A 5' HOWSE FINISHING MOWER, FITS C360" is in sale since Thursday, May 17, 2012. This item is in the category "Business & Industrial\Heavy Equipment Attachments\Mower Decks". The seller is "gaequip" and is located in Swainsboro, Georgia. This item can be shipped to United States.